Look around and you’ll notice the era of reefer madness is dying a slow death all over the country. Last week, Colorado and Washington became the first two states to to officially legalize it, as Peter Tosh might say. And yesterday Reason.com, somewhat fittingly, broke the story that RI state Rep. Edith Ajello plans to reintroduce a bill that would legalize and regulate marijuana much like alcohol. Maine is considering doing so too. This is how we would get people from Massachusetts and Connecticut (and further afield) to come here and spend money. People will not be driving past much better casinos in their home states to come to our little joke of a casino in the woods of Lincoln. And unlike gambling addiction and the toll it can take on families and communities, smoking pot doesn’t really hurt anyone else and we all know massive amounts of people are doing it, legal or not. Follow the link to RI Future to view a short video interview with State Rep. Edith Ajello. You must be a pot head. If you DO smoke pot you should realize, that legalizing will only make it more expensive for you. The medical marijuana act has enough flaws, allowing pot to be grown, sold and smoked in homes with children which has torn my family apart. Legalizing marijuana won’t make kids less likely to smoke as Rep. Ajello suggests. My 16 year old can get cigarettes illegally, I’m sure she will get pot as well. It’s hard enough to tell a child smoking pot is bad; I don’t appreciate the State making it harder by contradicting my parental opinion. The future of career day in schools will be “hi, I’m Joe and/or Jane, I’m a drug dealer”. REALLY?! I don’t think it’s fair to allow business owners to become rich by making drug users/addicts of our citizens. I intend on testifying in opposition at the committee hearing on this issue. I urge all others to have your voice heard; contact state reps and join the fight at the state house. I have actually never smoked pot in my life, but thank you for your assumption. As you are testifying to maintain the prohibition of marijuana, will you testify in favor of the re-prohibition of alcohol? It speaks volumes that you’re only response was about alcohol. Is that the ONLY defense to legalizing marijuana? I can’t change what has already been done,I’ve tried.What I can do is protect my children now. If the state needs more money why not increase the fines for possession? The defense to legalizing marijuana is that it is a harmless weed. I’m sorry that your family situation is so painful that it causes you to randomly lash out at people on the internet. Your situation does not mean that everyone else needs to be held criminally liable for cultivating and or smoking a weed. Molly – the roots of marijuana prohibition in the United States can be traced to xenophobia and corporate interests. As a consumable substance, it is far less dangerous than tobacco, alcohol, prescription opiates and even caffeine, which are all perfectly legal and regulated. The facts are well outlined here: http://www.drugscience.org/intro/arguments.html. The potential for addiction is vitually nil, the physiological effects are negligible and it is impossible to overdose on marijuana. If you are opposed to the legalization of marijuana, then you should also be beating the drum to make tobacco, caffeine and alcohol illegal as well, as Jef said. You also mention that you are worried about protecting your children. 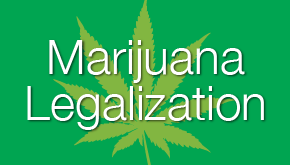 Recent studies show that it is far easier for a minor to obtain marijuana on the black market than it is for them to obtain legally produced and regulated alcoholic beverages. Regulating and controlling its distribution and sale will make it more difficult for minors to get it. I smoke pot. Not very frequently, but I smoke it. I also drink alcohol, far more frequently than I smoke pot, but not all that regularly. I grew up in a household where I taught that drugs are bad and I should avoid them. I was also taught that alcohol should only be consumed by mature adults (I have several relatives who are alcoholics, some still drink, others don’t). My mother was a smoker (cigarettes). She’s been a non-smoker for at least 10 years now (I honestly don’t remember when her last cigarette was, it’s been a while). I was taught that cigarettes are really bad. It is the individual’s own responsibility to take care of themselves. It is the individual’s responsibility to decide what they put in their own body and what they do with their own body. It is the government’s job to make sure that what the individual does to themselves does not infringe on the rights of other individuals. I have never known any family who was torn apart because of marijuana. The only time that has ever happened in my knowledge was when one of the family members was arrested for marijuana (which I have known several people who have had that happen, some were selling, some were smuggling). You kill your credibility by saying things like “you must be a pothead” or “of course you’ll bring alcohol into the argument”. The former is just silly. Why even say such things? And the latter? Well, of course it was brought into the argument. Alcohol is a drug that is more dangerous than marijuana. Marijuana is currently classified as a drug more dangerous than cocaine. Tobacco is more dangerous than marijuana. So yes, other drugs, including alcohol, should be brought into the argument. It is not the government’s job to play nanny. It is their job to make sure people don’t infringe on the rights of others. I personally believe marijuana should be legalized NOT because I want to smoke more pot, but because an individual should have the right to do what he or she wants to do to their own body as long as they are not infringing on the rights of others. And your argument that pot will be more expensive is also incorrect. Pot is current as expensive as it is because it has to be sold through the black market. It has to be grown in secrecy or smuggled into the country. If it were legal, it will likely be cheaper, but it will also be taxed. Perhaps it will cost as much as it does now, but it will not be more expensive. If you want to protect your children, consider this: Smoking pot is not ideal behavior but it is quite unlikely to ruin their lives – unlike an arrest record! The future of career day in schools will be “hi, I’m Joe and/or Jane, I’m a drug dealer”. REALLY?! I don’t think it’s fair to allow business owners to become rich by making drug users/addicts of our citizens. I intend on testifying in opposition at the committee hearing on this issue. I urge all others to have your voice heard; contact state reps and join the fight at the state house. Thanks for inspiring me, Molly! Without you, I probably never would have taken time out of my busy day to show up in support of legalization. Ryan is right. There are more people addicted to and abusing prescription drugs (and alcohol) than there are people addicted to and abusing marijuana. It’s because marijuana is not physically addictive. I know lots of people who smoke pot regularly (some of them also use other non-prescription drugs). These people are all otherwise law-abiding citizens who do not affect the lives of others. They live their own lives, hold jobs, and are good citizens. Why should these people possibly have their lives ruined because the government feels it’s necessary to tell us what we can and cannot do with our bodies?